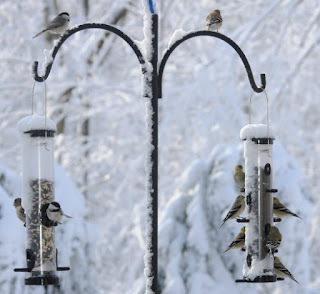 A cold, icy winter snap across mid-Michigan, forces the birds to return to our feeders in droves. Ice storms can cover this food and make it unattainable. Natural sources of food for finches and other birds are locked in by ice and make it hard to forage. Even clever birds that have collected and hid backup food all over their territory like the titmice, woodpeckers, nuthatches and chickadees will have to find other sources of food until these stores are revealed when the ice melts. So while their backup foods as well as natural resources aren’t available, birds will seek out feeders. If you aren't seeing an increase in bird activity, check to make sure the seed is fresh and the feeders are clean. The last rain may have spoiled seed in the feeders. Winter is the time when high fat foods become more critical in a bird’s diet. Every night up to three-quarters of a bird’s fat reserves are used up; reserves that must be replenished the next day. When fat reserves are depleted, protein — mostly scavenged from muscle tissue — is depleted to keep up with energy needs. Keeping your feeders filled with high energy, high fat foods can provide your birds with the critical nutrition they need to survive. High on the list of best choices to meet this nutritional need is suet. Our most popular Wild Birds Unlimited seed blends are No Mess Blend and Choice Blend because they are filled with many of high fat seeds and nuts making them ideal foods, along with suet, to offer your birds this winter.